Marking a major milestone in a process that’s taken 20 years, the Santa Clarita Valley Sanitation District of Los Angeles County Board of Directors has hired a contractor to build a new $87.3 million water treatment plant to remove salt and other contaminants from wastewater the city discharges into the Santa Clara River. The panel’s three members — Santa Clarita Mayor Marsha McLean, City Councilmember Laurene Weste and Los Angeles County Fifth District Supervisor Kathryn Barger — awarded the contract to OHL USA Inc. during a hearing at City Hall Thursday. The Irvine-based contractor will build a new advanced water treatment facility at the Valencia Water Reclamation Plant on The Old Road near Rye Canyon Road, one of two local reclamation plants that discharge wastewater into the Santa Clara, the last natural river in Southern California. The plan approved Thursday also included upgrades of existing water disinfection technology from chlorine to ultraviolet at the Valencia plant as well as the Saugus Water Reclamation Plant on Soledad Canyon Road near Bouquet Canyon Road. “That will remove very caustic chemicals from eventually seeping into our groundwater,” Weste said. The new facility and technology is projected to be operational in four years, with the construction cost passed through to water consumers over “30-something years” via incremental increases they’ve already begun paying, Weste said. Two decades ago, the state Regional Water Quality Control Board ordered Santa Clarita to remove chloride from wastewater discharged into the river because salty water is deemed harmful to wildlife and agriculture downstream, as the Santa Clara flows west through Fillmore, Santa Paula and the Oxnard Plain to the Pacific Ocean. “We have a state-mandated deadline of July 1, 2019, to have the chloride compliance facilities in place,” said Basil Hewitt, public information supervisor for the Los Angeles Sanitation Districts, which includes the SCV Sanitation District. Failing to meet that deadline could have resulted in steep state fines or a loss of local control. “We should now be past all complicated issues with (compliance) with this decision to build the new facility,” Weste said. The initial estimates of compliance ranged from $500 million to $700 million. The SCV Sanitation District was established to develop a Chloride Compliance Plan. 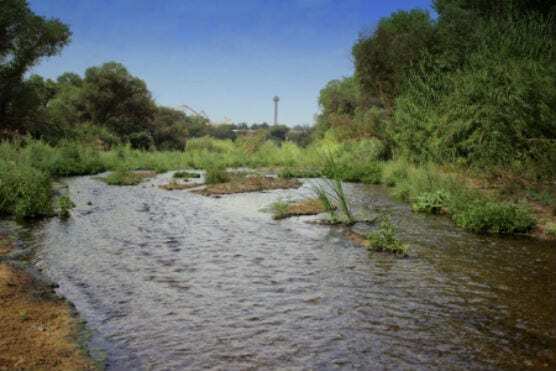 Over the last 20 years, the district has negotiated with the Regional Water Quality Control Board to make the SCV plan’s scope and cost more reasonable, and to address concerns and legal challenges raised by environmental groups. In October 2017, a ruling in LA Superior Court partially discharged a complaint filed against the district by the Affordable Clean Water Alliance, finally clearing the path for the district to finish the design of facilities for the various elements of its compliance plan, then select a contractor to build the advanced water treatment plant. Wastewater generated in the Santa Clarita Valley, from actions such as flushing toilets and washing laundry, is sent to the Sanitation District’s Saugus and Valencia Water Reclamation Plants for treatment. The treated water leaving the plants that is not directly reused for landscape irrigation and other applications is sent to the Santa Clara River. While the water reclamation plants provide a high level of treatment, they do not remove chloride. If levels of chloride go too high, they could harm wildlife or have a negative impact on downstream farms that rely on river water for irrigation. The Santa Clarita Valley water supply contributes the majority of the chloride coming out of the Sanitation District’s treatment plants. The largest added source of chloride is from residences. The Santa Clara River Chloride Reduction Ordinance of 2008, approved as Measure S by voters on Nov. 4, 2008, required the removal of all residential automatic water softeners by June 30, 2009. Enforcement began on Aug. 4, 2011, to remove the 2,500 water softeners still installed. Read more on SCVNews.com about the chloride compliance effort. I remember reading about this over the last 10-20 years either on-line or in the Signal. It seems to me that the major concern by local leaders was that the very nature of our local water sources assured that there was already high levels of chlorides in local ground water that had not yet been infiltrated by any local water treatment. AKA, it’s natural for high sodium levels to exist in our local groundwater, including the deeper aquifers. If my recollections are correct, we will be paying for water treatment to remove a minor non-man-made participant in natural groundwater in addition to removing any chlorides generated by our older water treatment plants. So are we being punished for having 1980’s water treatments plants that were approved by the local county and state offices? Pushme-Pullyou? The Worm Ourobourous biting it’s own tail? Success is apparently it’s own punishment, according to the State of California. At least the Ventura farmers and orchardists will be happy.